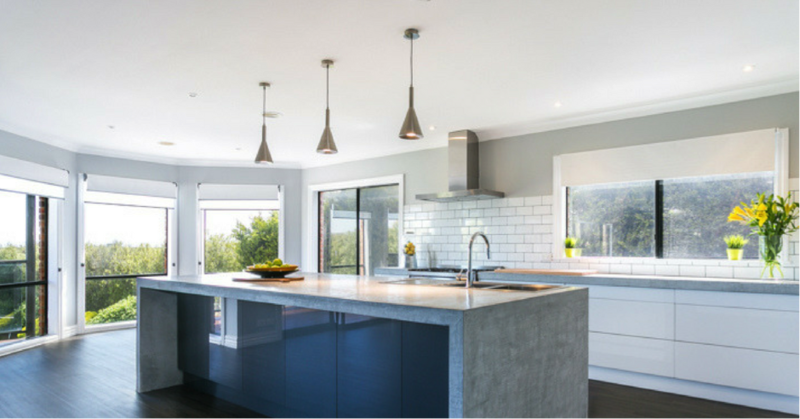 Choosing the right kitchen for a new home or renovation can be very daunting. 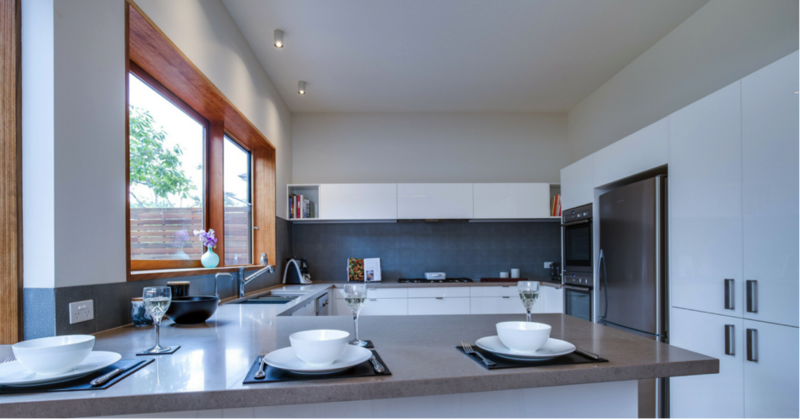 So many decisions to make – layout, style, colour, appliances, cabinetry, accessories. And the fear of making a wrong decision is real. 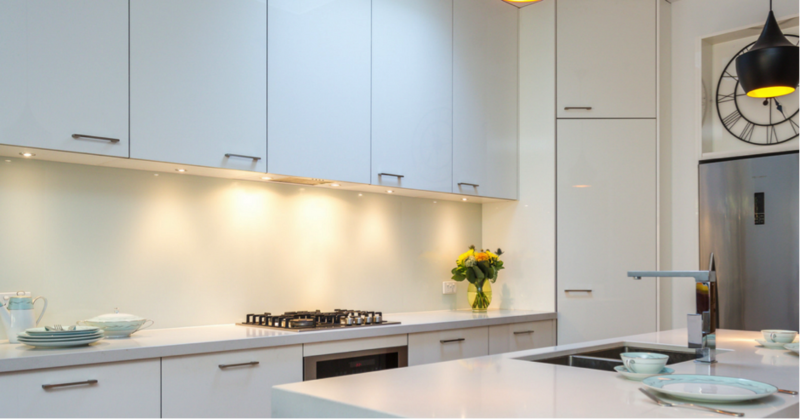 A mistake could be costly and you may not get the kitchen you visualise. So, we have decided to do a series of blog posts looking at all the aspects of kitchen design. This one explains the different kitchen styles popular in Australia. A recent study by Houzz found that people are spending big on kitchen renovations because the kitchen is now the heart of the house. No surprise there – It’s where the family gathers after work and school, often hovering around till bedtime. There is also more informal entertaining centred around the kitchen. It has become a hub that gets a lot of attention for how it looks and feels. What are the different kitchen styles one can choose from? This style is defined by a lot of detail in the cabinetry, the accessories and even the appliances. This style fits in beautifully with more traditional architectural styles like the Californian Bungalow, Federation or Victorian homes. Some of our clients have used our traditional kitchen designs to transition seamlessly from a period home in the front to a modern extension at the back of the house. 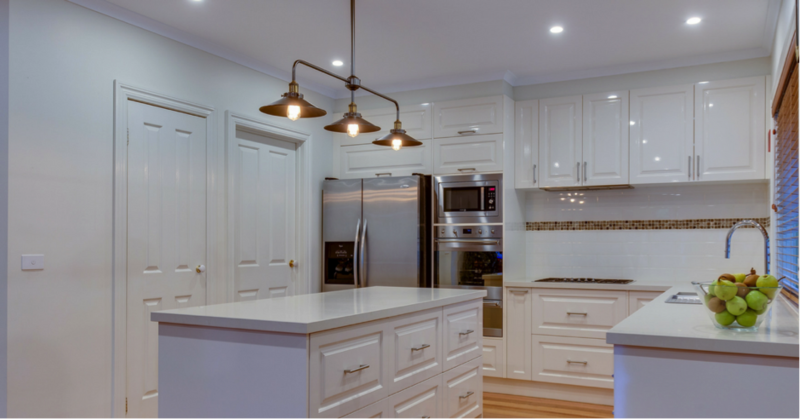 Note the detail in the picture – the cabinets and drawers all have framed doors, the doorknobs to the pantry are decorative and detailed, the light fitting is an industrial, timeless accent piece. It looks nothing like grandma’s kitchen but has all the warmth of it. And there is no compromise in the latest in appliance technology – from the cooktop and concealed rangehood to the microwave and wall oven. Here is another example of a traditional kitchen that allows for some striking inclusions. 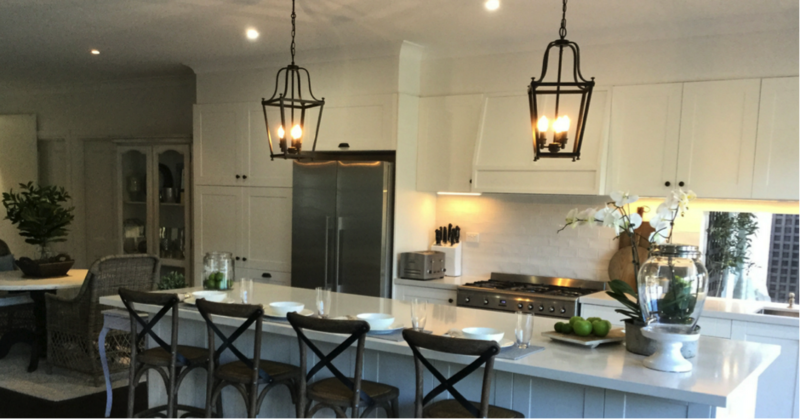 The cabinetry framing has simple straight lines, but doorknobs, the bar stools and the lighting add old world charm to this very inviting kitchen. An antique, carved display cabinet fits in beautifully as a feature or conversation starter. The white mock-brick splashback adds to the period feel. If you have antique furniture or a family heirloom you would like to include in the space, this is a design we’d highly recommend. Nothing says home better than memories. The traditional style allows for incorporating any amount of detail you wish – from many intricate features – to a simpler version like this one below. The cabinets doors are framed like in traditional kitchens, but the look is more streamlined and there is less intricate detailing. 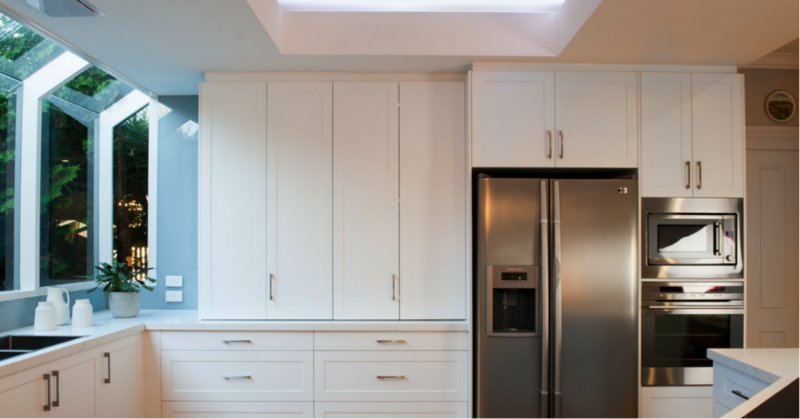 A skylight lets in natural light eliminating the need for feature lighting. Before we go into what these kitchens look like, we’d like to answer a question so many of our showroom visitors ask. What is the difference between contemporary and modern? We will keep it simple – modern design defines a break from the ornate, detailed architecture of the past. Modern is about simple, clean lines with no embellishments. Modern as a design form has been around for many decades. Contemporary simply refers to ‘a design of recent times.’ And yes, it is associated with the clean, simple lines of modern school, and that’s why the term is used interchangeably. Contemporary design often accommodates embellishments in form of a focal point or a distinctive shape or form or use of innovative material. Coming back to kitchens. The modern kitchen itself is about flat surfaces, simple straight lines with no intricacies. The finish of the materials and the calm, decluttered look is the hallmark of this style. Like this one here. Here simple clean lines and muted colours result in a calm, soothing very easy-on-the-eye space. This one below is another example. This one is monochrome, with the light fixture providing visual relief. These spaces, although intrinsically simple, can be very effectively accentuated by statement pieces. Such as the roman numeral clock. If contemporary is your style, here is one where the material speaks out. Handless drawers and cabinetry give it a super sleek look. The industrial polished concrete benchtop is the feature of the kitchen. The muted colours and the white New York subway tiled backsplash complete the Zen-like look. Hopefully, this post has been helpful in understanding a few popular styles. No doubt there’s more questions going through your mind. Take your time to look at every option you have. 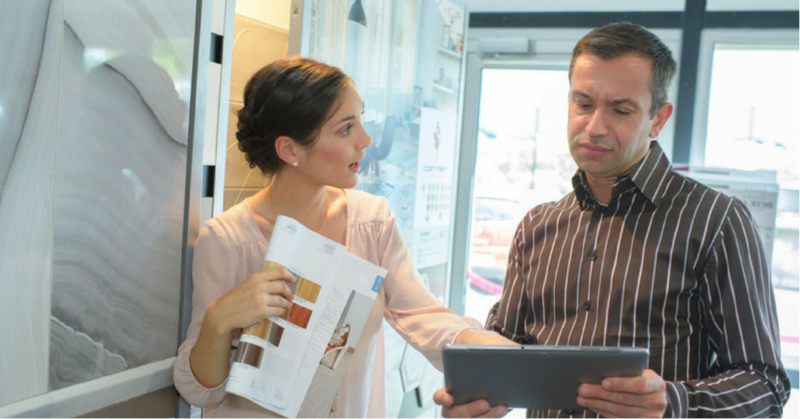 Come visit one of our showrooms in Cheltenham, Nunawading or Richmond and we may be able to help with more information for that initial decision making process.